I love the crisp air, and harvest time, and hayrides, and watching the leaves turn colors. I love squash, and apples, and spice, and all those nice things that we start eating when the weather begins to get cooler. I love being able to turn on my oven again without turning my apartment into a sauna. I love roasted meats, and roasted vegetables. It is wonderful that is getting chilly enough to be able to eat cheesy, creamy sauces again. I love stew. We are currently in the throes of Concord grape season — not for much longer, but long enough to partake in what must be the very essence of childhood. Concord grapes have that grapey grapiness that turns your tongue purple with nostalgia. The taste instantly transports me back to lunch in the third grade. This tart is far from the PBJ’s that I ate as a child, but the flavors are still there — just in a more refined way. The original recipe from Epicurious seemed a little too sweet to me, so I eliminated the extra brown sugar in the peanut butter topping. Also, the recipe calls for the Concord grapes to be halved and tossed with Concord grape jam as a topping. However, as Concord grapes are pretty fabulous on their own (commercial jam is usually too sweet anyway), I opted to get rid of the topping and make my own Concord grape sauce with local grapes. 2. While your oven is heating up, blend the graham crackers, the peanuts, and the allspice in your food processor until the nuts are evenly ground up. Add the melted butter, and pulse everything together until the crumbs are evenly moistened. 3. Turn the moistened crumbs out into the fluted tart tin. Using your fingers, firmly press the crumbs evenly into the bottom and up the sides of the tin. 4. Set the tart tin gently on a half-size sheet pan that is lined with parchment paper. Bake the crust in the oven for about 10 to 15 minutes. When the crust is lightly browned and “set,” remove it from the oven and let it cool. 5. While the tart crust is cooling, blend the peanut butter, the butter, and the cream cheese together with an electric mixer set at medium-high speed until the mixture is fluffy. In a separate bowl, whip the cream and the vanilla together until soft peaks form. Fold the whipped cream gently into the peanut butter mixture. 6. Very carefully spread the jam over the bottom of the cooled tart crust. If you have an offset spatula, this is a little easier to do, but it’s okay if you don’t (I do have one . . . something I realized only after the tart was done). Wipe off your spatula, and carefully smooth the peanut butter topping over the top of the jam. Chill the tart in the refrigerator until the tart is firm, about 3+ hours. 7. While the tart is chilling (tart be chillin’! ), prepare the sauce. Over a small bowl, slip the skins off of all the Concord grapes (they should come off easily, and if you do this over a bowl, the bowl will catch all of the juices). Reserve the skins, and keep them in separate bowl. 8. Bring the pulp and 1/2 cup of water to a boil in a small saucepan. When the peeled grapes have turned opaque, pour them into a mesh sieve set over a medium-sized bowl. Using a spatula, push the pulp through the sieve. Discard the seeds. 9. Add the grape skins to the bowl of grape pulp. Using an immersion blender, purée the skins and the pulp together. Push the mixture through the fine-mesh sieve set over a bowl, pressing the remains of the grape skins with a spatula to extract all of the juice. Discard the grape skins. 10. In a small saucepan, combine the strained grapes with the sugar and the lemon juice. Set the pan over medium heat until it begins to boil. Skim any foam that you see off of the top. When it begins to boil, lower the temperature until the sauce is just barely at a simmer (be careful that it doesn’t boil over). Keep the sauce at barely a simmer until it has thickened and reduced to a syrupy consistency. When it gets to that point, turn off the heat and let the sauce cool. 11. When the tart has cooled and set, cut it into wedges. 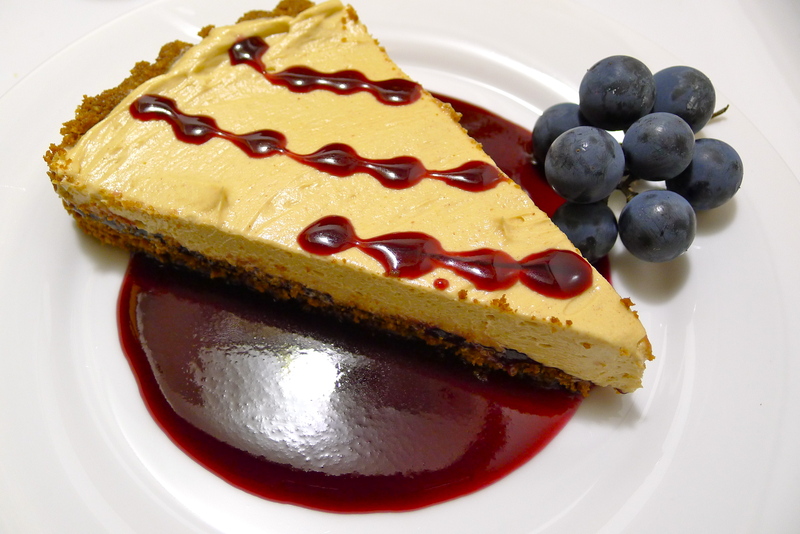 Make a pool of grape sauce in the middle of a dessert plate, and place one tart piece on top of the purple puddle. Serve immediately. * My recipe actually makes quite a bit of sauce, and I imagine that if you prefer to not have any commercial jam in your tart at all, you could just cook the sauce down further — with the addition of a 1/4 cup more of sugar — until you have a thick syrup. Use this instead of the jam as a layer. Thank you for dropping by and for adding me to your Reader! Oh awesome, what a great recipe. To be honest PB&J is in no way a big thing in Britain, but I totally got what this recipe was trying to do and it sounds really great. I don’t think I’ve ever even tried this combination of flavours. Thanks for the comment! Yes, the sweet/savory thing is really American. It’s a mainstay of Thanksgiving, which can resemble a giant panoply of foods that are specially designed to seem strange to anyone but us — like sweet potatoes topped with mini-marshmallows, cranberry sauce, pumpkin pie! Peanut butter is not so used outside of the US, but if you have a tub of it, I would definitely try it with some jam! This looks fabulous! What a clever and fancy take on PB&J! Um. Wow. I think I’m in love. (And your photos look great, by the way!) Could you taste the allspice in it? That’s a really interesting addition to the flavors of PB&J. Thanks! I’m not sure about whether or not the allspice is that noticeable . . . but then again, peanut butter is such a strong flavor that it tends to overwhelm anything subtle (like an 1/8th of a teaspoon of allspice). But then I wonder if I would like a stronger allspice taste . . . maybe not . . . I have to thank you too for giving me the idea to put the sauce under the tart! I read your Chicken with Caponata post, and thought that it was a good observation! I tried taking a picture of another slice with the sauce on top, and it looked a little bit like an extra from True Blood! Definitely nostalgic flavors! Beautiful tart and looks so yummy! Thanks! The peanut butter topping is actually really light and fluffy. Super smooth too. I think that I was thinking it might stick to the roof of my mouth like just peanut butter, but it doesn’t! Thank you! Bookmarks are super useful, but I think I have too many now and can’t find anything!